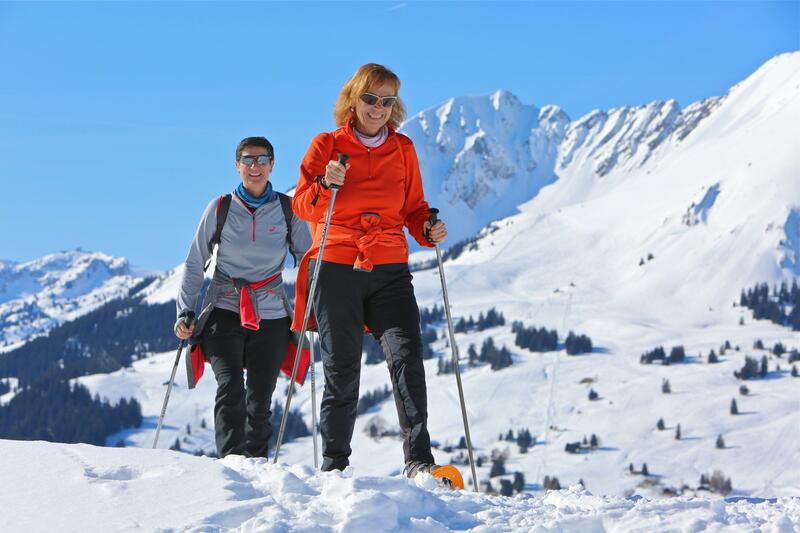 In winter the Les Mosses-La Lécherette plateau is also the stage for trekking on snowshoes. It’s a foretaste of the Far North with treks to the very heart of nature. Snowshoes strapped on, whether with the kids on a family outing or with a group of friends, it’s the perfect escape ! At the heart of an unspoiled landscape, a winter hike on snowshoes provides an invigorating shot of vitamin D ! Snowshoes allow you to glide through the snow without sinking down into it. The traditional equipment of Canadian trappers has come a long way over the years. Now lighter and simpler to maneuver, it’s so much easier to set out on an adventure. In both Les Mosses and La Lécherette, the trails are pisted for easy access to the snowy plains and the picturesque forests of snow-capped pine trees. Whether on the pedestrian trail in the centre of the resort or on the heights of Praz-Cornet, everyone can find their perfect spot for a trek. Several cafés are en route offering the perfect excuse for a welcome warm-up or simply to swap stories of experiences along the way over a revitalising mug of hot chocolate.